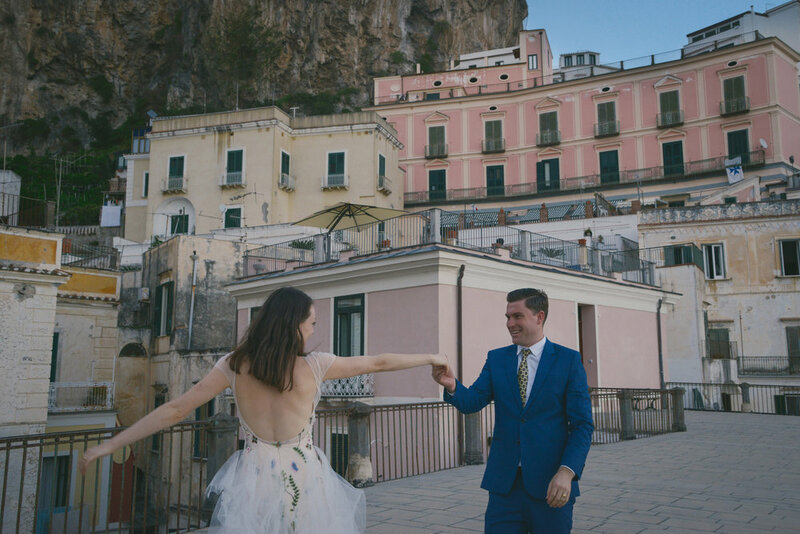 On a warm August day, in the little town of Ravello just off the Amalfi coast, our very own Well Travelled Bride founder Kelsey Genna and her partner David Palfreyman eloped. As a bespoke wedding gown designer and editor of a destination wedding brand, Kelsey knew immediately after they became engaged that there would be high expectations for their special day. Instead of stressing about details and guest lists right away, they decided to throw the pressure of a giant wedding out the window for a bit and do something a little more adventurous and intimate instead. Kelsey designed her own gown in the same way she would design a dress for any special occasion. Simple elegance was the key, and Kelsey achieved it in an ephemeral, hand-embroidered gown that mirrored the soft beauty of Ravello. Her only splurge of the day was a pair of Baroque-inspired chandelier earrings picked up in Rome from famed Italian designer Maria Teresa Percossi of Percossi Papi. In keeping with the relaxed feel of the elopement, Kelsey styled her own hair and makeup and even picked fresh flowers for her bouquet from the garden of the Sant Alfonso villas. After the wedding, the newlyweds explored the streets of Ravello, eating gelato, soaking in the views, and dropping by local chef Mamma Agata’s home for her famous lemon cake and limoncello. Following desserts, they headed out for the coast but were surprised by the popping of a tire. Ever the chic jetsetters, they changed the tire in their suit and wedding gown, providing some of the most cherished and laughed-over memories of the trip. As the day drew to a close, Kelsey surprised David with a boat ride in the Mediterranean Sea at sunset. “We drank champagne and wrote post cards to our family telling them the news!” Kelsey remembers. They ended the night with a delicious meal at Marina Grande and a promise to one another to celebrate again with a formal event for family and friends in New Zealand on their one year anniversary. When looking back over the details of their elopement, Kelsey adamantly insists that she wouldn’t go back and replan it any other way. “There is nothing more special than the moment of walking up the aisle knowing that you're doing something so monumental and life changing. I'm sure this moment is incredibly romantic no matter what the setting or audience, but it really did feel special standing over the cliffs of Amalfi with no one but ourselves.” If its ability to cause even a wedding destination editor to reminisce so sweetly over her own European nuptials is any indication of its fabulousness, the Amalfi Coast may just be one of the most romantic and memorable destinations for any Well Travelled Bride. 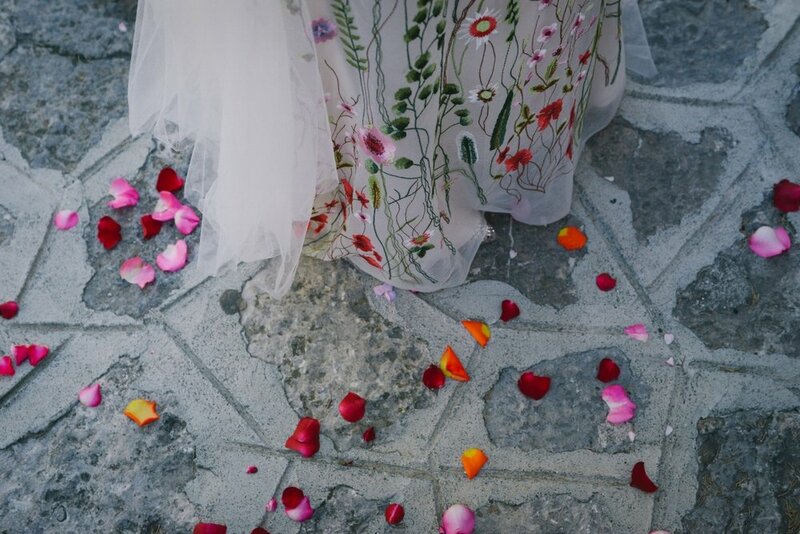 Planning an Amalfi Wedding? Download our full planning guide!